In most cases, loons die when they are hooked by fishing lures or snarled in monofilament line. Cases in which birds are able to free themselves and recover — or we catch them, nurse them back to health, and they put their lives back together — are the exceptions. So we are thrilled to report that the 9 week-old chick that was hooked in the leg, captured by our team, and placed on antibiotics by Wild Instincts to rid it of the resulting infection, was released on its natal lake last week and is now behaving normally. Indeed, Gabby saw it circle its lake three times in flight shortly after release. Juvenile loons have a relatively short window during which they must: 1) learn to capture fish and invertebrates underwater, 2) learn to fly, and 3) develop large enough fat stores to migrate south to Florida for the winter. It seems remarkable that this youngster has bounced back from its dangerous encounter with humans to the point that it might be able to make the journey with its cohort. We have reached the time in late summer when — following many trial runs, crashes and ugly landings — chicks have begun to fly. But chicks do not always take wing, circle and land in their own lake. They wander. The picture below was taken on September 17th by Bonnie Montgomery of Fifth Lake, east of Rhinelander. She caught the legs on a departing loon well enough that we could identify it (see two bands on right leg pointed out by green arrow) as one of the two chicks raised on Buck Lake, south of town. We have a keen interest in the local wandering of chicks like this one. Following our finding that loons settle on breeding lakes that are similar to their natal lakes, we are interested to see how this preference takes shape. Perhaps loons spend their entire lives preferring to live and forage in lakes of a certain size and water chemistry. If so, this lifelong predilection should make itself known early. That is, juveniles that begin to fly and visit lakes near to their natal lake should prefer lakes similar to the one on which they were reared. Kristin and Gabby this year, Nathan last year, and Joel in 2011 have examined the hypothesis that natal site matching (as we call the preference of a loon to breed on a natal-like lake) is evident even in the local wandering of chicks. It will take a good deal of data to examine this hypothesis, but we are hoping that our crew will collect enough data (especially after this year’s bumper crop of chicks) to make statistical analysis possible. Speaking of Kristin, Gabby and Joel, they caught another chick tonight that had become hooked in the neck by a lure and snarled in two types of fishing line. Luckily, the hook did not penetrate deeply. The lure was removed by Mark Naniot of Wild Instincts, the line was cut off of the bird, and the juvenile was released, still apparently in good health. 2013 has been a very bad year for loons and fishing! 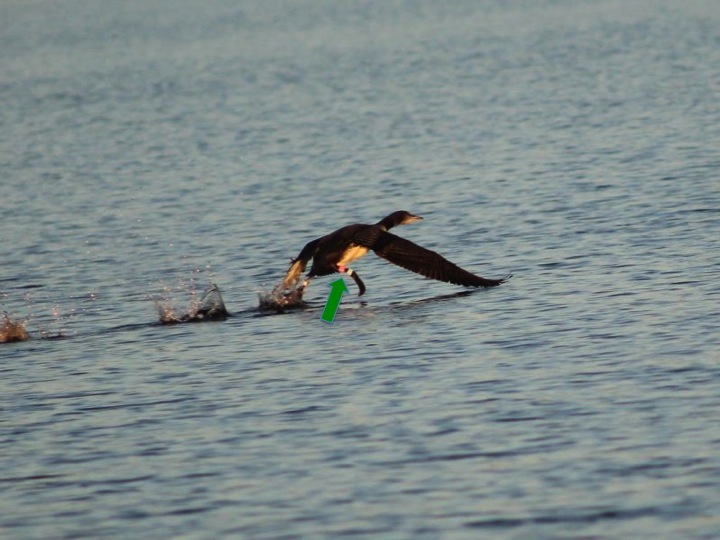 A week ago, a fisherman hooked a juvenile loon in in the leg. We know the juvenile well; it is a chick that hatched 9 weeks ago whose parents and territory we have observed all summer. As a 9 week-old, this chick is close to adult size. At the time of the accident, it was feeding itself for the most part and beginning to practice taking off and flying. The fishing lure changed that. 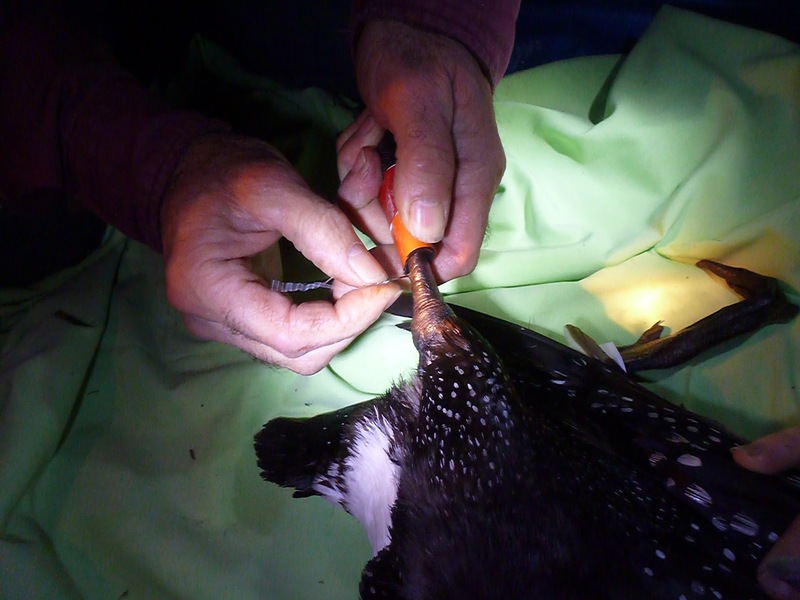 With a hook embedded in its left leg and monofilament line wrapped around the leg, the young loon no longer dove effectively and made painful and pathetic efforts to fly. 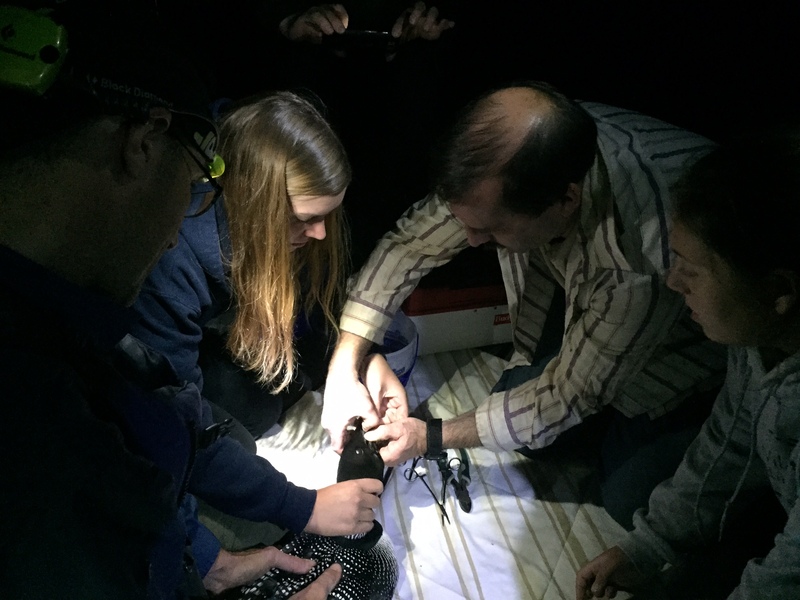 Fortunately, our team captured the chick last night. A round of antibiotics and feedings, administered by Wild Instincts, might give this youngster a chance to resume its development, regain its health, and ultimately head south with its brethren. We are hoping for the best. I have related several stories about the adventures and misadventures about loons in the study area, and I want to update followers on how those loons are faring. As one might expect, some loons that encountered difficulties were not able to recover, while other loons beat the odds and remain healthy and vigorous. Two chicks strayed from their parents’ territories to other territories on the same big lake, mingling with other families that were already raising larger and older chicks. In one case, the stray chick was apparently lost, as we have not been able to relocate the Pickerel-South chick that joined the Pickerel-West family. But the Thunder chick, which was considerably smaller than the two Boom-Hodag chicks, joined them and has gained full acceptance by the adults and its larger foster sibs, according to Kristin’s recent observations. (Today she reported that the adults are feeding the interloper!) While we do not understand why it left its parents to join another family, the Thunder chick has continued to thrive despite its dubious decision. The orphan that we placed with the new pair to complete a family of two adults and two chicks has been fully accepted and is growing and being fed by its foster parents. Its acceptance is so complete, in fact, that we are having to use a simple genetic test to determine which is the biological chick and which is the orphan! The territorial male that became entangled in fishing line in late June has died. We had thought that he would bounce back after Wild Instincts fed him and treated his wounds and we placed him back on his territory. Alas, he was unable to regain the weight he lost, and he did not survive for more than a few days after release. Since we used a similar protocol to treat and release another male in 2012 that survived, we are a bit puzzled by this male’s rapid demise. 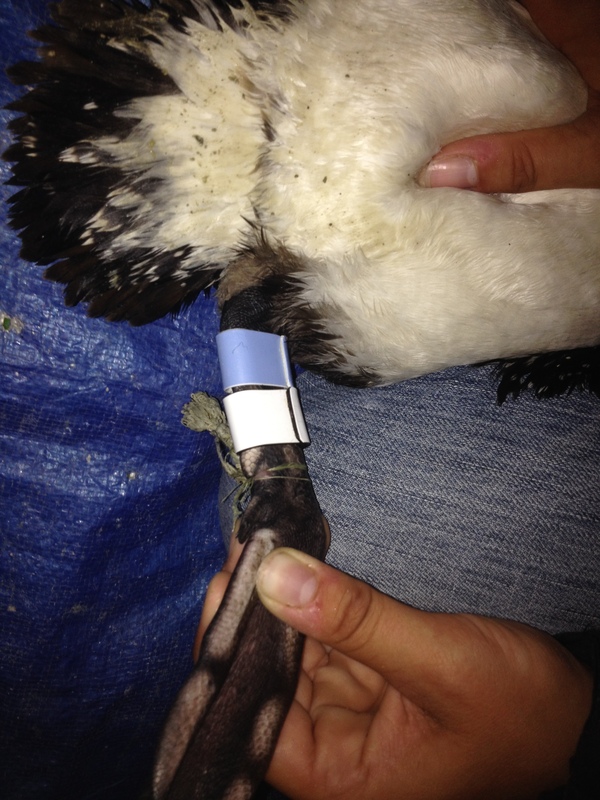 Obviously, the details of a loon’s injuries and its precise condition when released dictate its chances of recovery. We are sad to lose this male, who was a vigorous defender of his territory and produced three big healthy chicks during his life: two in 2009 and one in 2010. It has been a tough year for loons and fishing. One of our territorial males was hooked in the leg about 12 days ago, and the wound became infected. He was so badly impaired that he had trouble diving and “beached” himself on an island in the lake, as severely injured loons do. About a week ago, we captured him, and Wild Instincts nursed him back to health, treating the wound and feeding him to help him recover lost weight. Although a new male took over his territory, the recovering male is now back on his lake. (The lake is huge, so he will easily be able to use areas not frequented by the territorial pair.) We are hoping that he bounces back just like the male on Lower Kaubashine, who became hooked badly on a lure but was freed by Wild Instincts last year. That male too lost his territory but was strong enough to migrate, return, reclaim his old territory, and produce a chick this year. So happy endings are possible!